Today marks two years of the HerKentucky blog. Every member of our writing staff is so thrilled and humbled that y'all stop by to read our posts and visit our social media sites. It's so wonderful to know that y'all love the Commonwealth as much as we do! I wish we could all sit down together for a glass of bourbon and a cupcake today. Since that's a little difficult to manage, we've partnered with Louisville Stoneware to bring one lucky HerKentucky reader a stylish way to enjoy her favorite drink. 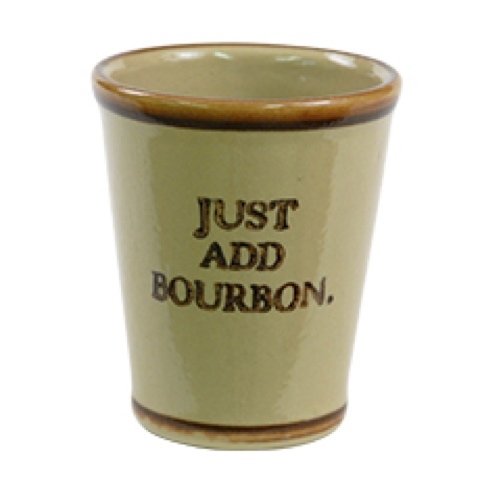 The Louisvilke Stoneware Mint Julep Cup is so fun, and its logo gets straight to the point. Located in the heart of Bourbon Country, and with a history of making whiskey jugs, it’s only natural for Louisville Stoneware to have a line of Julep Cups.The exact origins of the Mint Julep are unknown, but it is said to have originated in the southern United States during the eighteenth century. U.S. Senator Henry Clay of Kentucky introduced the drink to Washington, D.C., at the Round Robin Bar in the famous Willard Hotel. It was also the favorite drink of American author William Faulkner. The Mint Julep is best known as the official drink of the Kentucky Derby, a position it has held since 1938, with Churchill Downs making over 120,000 for Derby fans each year.Chill your Stoneware Julep Cup in the freezer for at least 30 minutes – it can be stored there permanently if you like. With a slightly flared rim, this cup is perfect for slow sipping – the only way a julep should be enjoyed. For an authentic Julep-sipping experience, we suggest following the recipe on our Julep pitcher. Cheers!Your stoneware can be safely used in the oven, microwave, dishwasher and freezer. Just remember to allow pieces from the dishwasher to cool before refrigerating. Likewise, you should allow refrigerated piece to return to room temperature before washing. As with any stoneware item, extreme and sudden variation in temperature may cause cracking or breakage. You can enter to win using the Rafflecopter widget. 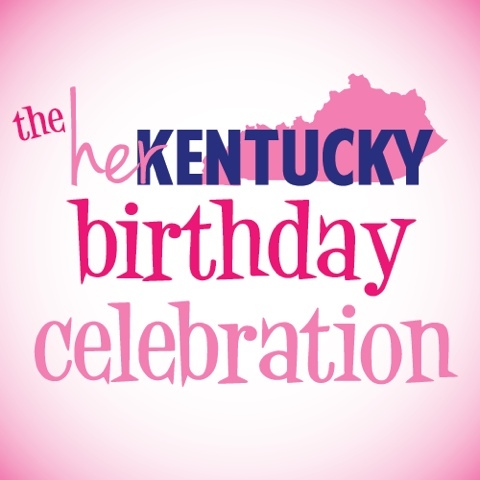 The winner will be announced on Monday, September 16th, and you can look forward to more HerKentucky birthday fun throughout September! Thanks so much to Louisville Stoneware for partnering with HerKentucky to bring y'all this giveaway. No member of the HerKentucky writing staff was compensated in any way for this post. Check back throughout September for more celebrations, giveways, and fun! In "HerKentucky", "birthdays", "bourbon", "celebrations", "giveaways", "louisville stoneware", "mint juleps", "parties"
A couple of years ago, I went to a blogging conference where I encountered the Smilebooth. The event of the night was a party celebrating the release of The Lorax. There was so much happy commotion coming from one side of the room, so my friend Holli and I checked it out. It's a photo booth, but taken to the nth degree of fancy. You stand in front of the fun backdrop and see yourself on a big screen. You get a remote control, and snap away. As you're snapping, the images all went to an iPad where you could peruse them when you were done. From there, you could email it, Tweet it, or Facebook it. Boom. Instant gratification and really fun photos. I mean, how fun would it be to get photos like this at event? Camera: Obviously you need to capture the photos, so set up a camera at the appropriate height and for the width of the background. Having a remote shutter release is great if you don't have someone on hand to snap all the pics. If you have a fancy schmancy camera that can connect to a TV, you can connect it for people to preview their photos when they're taken. Backdrop: Fun, festive backdrops are awesome. Make one by securing holiday garland or streamers to a wall or drop cloth and hanging. Or you can purchase backdrops from Etsy if there's something you're really going for. I love the backdrops that have texture to them. Here's an easy tutorial for a backdrop made of plastic table cloths. Props: This is where things get fun. Make or buy props. Funny hats, stick moustaches, balloons, feather boas, picture frames, and more. Lots of Etsy sellers have great prop packs. A gallery: You want your friends to be able to access and share the photos, so upload them to a gallery after the event. You could use Flickr, Picasa, Smugmug, or even just Facebook. Have you ever set up a photo booth for an event? How did you do it? I recently had the opportunity to attend the most delightful party! Our friends at Story Magazine unveiled their new website at the Green Building in Louisville's trendy NuLu District. It was great to catch up with Story's publisher, Julie Wilson. I even saw our very first HerKentucky Business interviewee, Carolyn Hannan of Bourbon and Beans! Are y'all reading Story Magazine? You certainly should be. They always have a unique perspective on Kentucky life. I love any media that doesn't reduce us to dichotomies like hillbillies vs. debutantes, or coal miners vs. thoroughbred owners. Julie has done a fantastic job of breaking down those stereotypes and showing some great glimpses into Kentucky life. As my beau and I left the party, we caught a glimpse of the most gorgeous sunset. It was a great end to a fun day! In "celebrations", "downtown louisville", "nulu", "parties", "story magazine"